Russia, after the break-up of USSR into 15 CIS countries, has been reduced to a country with long, flat borders that are difficult to patrol and defend, with most of its neighbouring CIS countries, and precious little access to the sea except to the icy Barents and Kara Seas. ; and through Kaliningrad, an outpost cut off from the contiguous land mass of the rest of Russia, to the Baltic Sea. Russia also has a narrow window to the Black Sea southwest of Volgograd. Commercially, it has much of Europe by the short hairs, because of its stranglehold over supply of natural gas. At least 18 CIS and European countries are between 25% and 100% dependent on Russian natural gas, and have almost fully converted to gas for internal heating. So, every winter since 2005, when large parts of Europe are difficult to live in without gas heating, Russia turns on the diplomatic pressure using Ukraine (through which its gas pipeline passes) as the whipping boy. Over the last 6 years, Russia has played hardball and negotiated hard with Ukraine. This year's negotiations may begin any time now. 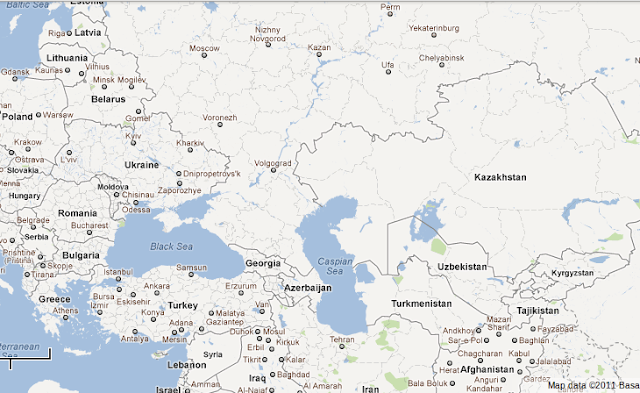 CIS Countries Map taken from Google Maps. Russian troops have recently (in April, 2010), ostensibly at the invitation of the Kyrgyzstan Government, bivouacked in Kyrghyzstan, thus making Tajikistan, Kazakhstan and Uzbekistan, the three CIS countries bordering that tiny, poor country, very uncomfortable. Kyrgyzstan is mostly mountains and highlands, giving this country strategic vantage points to peer into their neighbours' backyards. At the south-east, Russian troops can look down from the Tien Shan mountains almost into Tashkent, capital of Uzbekistan. At the north, from Bishkek, the capital of Kyrgyzstan, if you shout, you can be heard in Kazakhstan. Indeed, Almaty, the largest town in, and the former capital of, Kazakhstan, with 9% of this thinly populated country's population, is less than 250 kms away. I had predicted in this blog in April, 2010, that there will be trouble in Kazakhstan in the next 2-3 years, covertly fomented by Russia. This seems to have begun, if this report is to be believed. A state of emergency is currently in force, and curfew imposed, in an oil-producing town. Kazakhstan is an important exporter of crude, and interruption of supplies are a possibility, leading to upward pressure on global oil prices. The third country, Tajikistan, large parts of which are mountainous and inhospitable, borders Afghanistan, a geo-politically important state. Besides, Tajikistan is currently locked in a dispute with Uzbekistan about sharing of waters of a river which is being dammed in Tajikistan. Kyrgyzstan also has a long border on the east with China, and from the mountains there, you can peer into China's Uighur (muslim) province, which Al Qaeda cells have reportedly infiltrated. Further, the US has an air base called Manas in Kyrgyzstan which is a supply line to Afghanistan. Since the new Kyrgyzstan Government owes its existence and continuance in power to Russia. This air supply base for US operations in Afghanistan is in danger, if Russia is angered by US foreign policy. Kaliningrad gives Russia a shared border with Lithuania and Poland, and easy access to North Europe. As Lithuania is 100% dependent on Russia for its natural gas, like Latvia and Estonia, Lithuania has not much choice but to allow Russia land and airspace access to Kaliningrad, which is at the forefront of Russia's objection to US missile bases in CIS countries or other East European economies: Russia threatens retaliatory placement of nuclear warheads and missiles in Kaliningrad, virtually on the doorsteps of several Europe-facing CIS countries and all major EU countries. Thus, being NATO member-countries is a cold relief for Lativa, Lithuania and Estonia. Russia's friendship with Venezuela and Bolivia through Chavez and Pablo Morales respectively raises the spectre of a “gas-OPEC” which can control gas pricing and distribution throughout the world. Even Iran and Kazakhstan have explicitly supported such an idea. Simultaneously, by offering sweeteners to Iran to lay a new pipeline for gas to Europe through its territories, it is moving forward to make Europe even more dependent on Russia for gas, far into the future. Note that Bolivia, Venezuela, Iran and Russia together account for 45% of proven gas reserves in the world. Add Turkmenistan, Kazakhstan and Uzbekistan, with whom Russia has signed long term exploration and supply agreements for gas (read: buys all its present and future gas output), and this figure crosses 50%. Throw in Equatorial Guinea, Trinidad and Tobago, Algeria, Argentina, Brunei, Nigeria, Oman and Qatar, all of whom are members of the Gas Exporting Countries Forum (GECF) of which a Russian is the Secretary General, and this formidable multilateral group controls more of the gas production and reserves of the world than OPEC did for oil. Besides, international companies have by now been pushed out of Russia, more or less, and Russian oil and gas is now consolidated in, and controlled by state-owned entities. Russia, along with 5 or 6 other UN member countries, notably including Venezuela, headed by Hugo Chavez, a known US-baiter, has recognized two breakaway provinces of Georgia (South Ossetia and Abkhazia) as separate countries in 2008. Russia has set up military presence in both these provinces, cocking a snook at the US and Europe, by drawing parallels to what they did by recognizing Kosovo earlier the same year over the objections of Russia. Thus, it breathes down the neck of the Georgian leadership, with South Ossetia being within shouting distance of Tbilisi, the capital. Abkhazia gives Russia much broader Black Sea coastline access, and cuts Georgia's access to it by half. When Georgia appealed for help, Europe did not budge because of its fear of angering Russia that supplies so much of Europe's natural gas. The US could not even think of coming to Georgia's rescue in these two theatres – because Russia patrolled access to Georgia via the Black Sea, and absent reliable supply lines, other than diplomatic support, it could do little else. Russia is so huge that it is easy to forget that in the south-east, Vladivostok, the last stop on the Great Trans-Siberian Railway at Russia's south-east tip, is very near the northern tip of North Korea, US's great bugbear. With the death of Kim-Jong Il, this geographic proximity has potential to invite international interest. I won't be surprised that with a young, untested leader in the saddle in N Korea holding a nuclear button, Russia and China attempt get friendly with N Korea. Revival of old proposals like a train from Russia through N Korea and onwards to S Korea; an oil pipeline through a similar route; and so on can be expected. In the north, the eastern-most point of Asia, that is almost permanently ice-bound, the Bering Strait separates US territory (Diomedes Islands, Alaska) from Russian by less than 50 kms, though a day apart on the calendar. (You may be able to spot Sarah Palin's kitchen from this part of Russia!) It is possible to ski across a frozen Bering Strait from Russia to the US (or vice versa) at this point (skiing to yesterday or tomorrow!). A time will soon come when Russia will begin to leverage these geographical quirks too. I found your rather concise article about Russia's strategic position interesting but some of your points are debateable to say the least. Briefly,here is my response: a)lumping together with Russia gas producers like Algeria, Nigeria, Brunei, Oman, Quatar,even Iran does not make your point stronger. They don't act like a Gas-OPEC and indeed they are competitors for market share. b) you did not mention the ever increasing proportion of gas supplied to the market as LNG with re-gasification facilities being built both in Western Europe and Asia. Japan has been importing LNG for decades and China's LNG share is growing rapidly. Nor did you mention huge known reserves of shale gas, both in the US and in Europe (Poland, UK, etc. )that will undercut Russian or Iranian gas. c)your reference to five or six countries that 'recognized' South Ossetia and Abkhasia is incorrect, apart from Venezuela there is none. Nauru island in the Pacific was bribed by Moscow but that 'recognition' was meaningless. Indeed Russia has demonstrated complete lack of diplomatic influence on this score. And, of course, there remains the legality of Russian troops presence in these two enclaves. d)you have also omitted any comment on the future of Russia's Far Eastern possessions ( eg. Yakutia, Buryatya, Tuva, etc.) given the cenrtifugal forces undermining Russia's security in the predominantly Moslem Caucasian region and a very realistic threat of the tens of millions of China's 1,350 millions population spilling over the border. This is already very much the case albeit in modest numbers. But in 10 to 20 years time Chinese settlers may well be in a majority in the sparesly populated regions north of the Amur river. Russia, with its nationalistic 'Russia for Russians' slogan will need to pull back from some territories to consolidate its presence in areas close to the Ural mountains in Asia and in Russia's European realms. Russian Federation as it exists today is unsustainable. Thanks for your detailed response. Here are my reactions to your points. a) I am not lumping these nations together - they have come together; the Gas Exporting Countries' Forum (GECF) was set up in Iran, has its Secretariat in Doha, Qatar and its Secretary-General is a Russian, Leonid Bokhanovsky. In June, 2009, the Algerian Energy Minister was elected Vice-Chairman of the GECF. Brunei, Nigeria and Oman are members along with several other countries that are significant gas exporters. I don’t say that they currently behave like a gas-OPEC - their coming together only raises the spectre of a gas-OPEC. Before OPEC was set up, its members competed with each other. Competition is eliminated or reduced by cartelisation - which looks imminent to me in gas market. b) Regasification of LNG capacities are being added in Europe, in spite of safety issues that have forced the US to not allow new LNG terminals to come up on their soil, beyond the 4 they already have. Europe is trying to build alternatives to gas from Russia. The US is building regasification units 10-12 miles offshore that would pipe gas to the shore, seen as costlier but safer. Economics of importing LNG will remain a challenge for US. Many major liquefaction centres are also members of GECF, and hence their interests are co-terminous with Russia’s. So if a gas-OPEC does come about, LNG will also be influenced. See http://www.worldoil.com/Article.aspx?id=37554 . Russia through its Sakhalin plant (6th largest in the world) is emerging as a major supplier of LNG to Japan and US from its Far East coast. Japan, China and US's rising dependence on imported LNG plays into the hands of the GECF and Russia. So the world's dependence on gas, whether piped or LNG, is increasing, making it more exposed and vulnerable to a gas-OPEC alliance, not less. Because of the cold climate in Eastern Russia, Russia has a 6 to 10% lower cost in LNG liquefaction over other players like Qatar and Iran. (See http://www.shell.com/home/content/aboutshell/our_strategy/major_projects_2/sakhalin/lng/). Further, UK's North Sea gas production has fallen sharply in recent years, while demand has risen. Recent rise in US shale gas production has led to the unusual situation US becoming a net exporter of gas, and hence competing with countries like Australia, but the entire shale gas industry is quite likely financing such production through debt while making operating cash losses. See http://www.energybulletin.net/node/49342 and http://blogs.wsj.com/dealjournalaustralia/2011/12/07/north-america-chases-lng-market-share/ . Besides, shale gas is marginally economical today, and its major use is as an alternative in case gas prices rise very steeply. c) Besides Venezuela & Nauru, the following UN members have recognized Abkhazia: Tuvalu, Nicaragua, Vanuatu and, of course, Russia. Vanuatu has not recognized South Ossetia. Hamas Government in Gaza (non-UN member) has also sided with Russia on this issue. d)I was not aware of the influx of Uyghurs from China into Tuva. Yakutia is already playing an important role in oil, gas and diamond mining in Russia. In this comment above, I have referred to the Sakhalin project above, in the Far East. About sustainability of Russia as it exists today, time will tell. But I won’t bet on Russia shrinking unless Putin is booted out of power.